Start the rice and cook according to the standard rice directions. In a small bowl, whisk to combine the brown sugar, soy sauce, sesame oil, red pepper flakes and ginger. Toss in 2/3 of the green onions and stir to combine. Pour in the soy sauce mixture, stir to coat, and allow to simmer 2-4 minutes, until warm and combined. 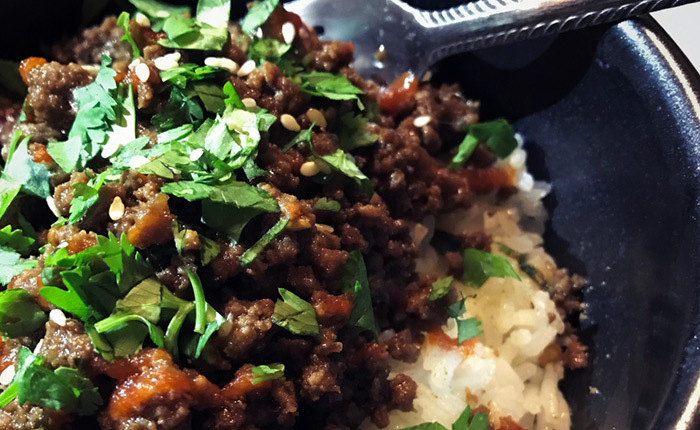 Scoop some rice into your bowl, add beef. Top with green onions, cilantro, sesame seeds, and a drizzle of sriracha.